Rodeo queen hair must be styled at the pageant as you plan to wear your hair as the titleholder. This means if you have no intention of breaking out the hot rollers once you are crowned the queen don't bother to use them during the pageant. While ginormous 1980's and 1990's hair is not necessary soft curls give a feminine appearance. Practice using hot rollers or your choice of curling iron beginning weeks before the pageant. You should learn to do "wings" at your ears. During the horsemanship portion of the pageant your hair MUST be pulled back into a ponytail if it is long enough to do so. This avoids the "flying albatross" appearance long, untamed hair can give. There are several different ways to pull your hair back but what is most important is that it stays pulled back. Rodeo queens NEVER wear their hair in a bun. Good quality hairspray will go a long way in maintaining the curl in your hair throughout the day. You will need to experiment with different brands to find one that works best on your hair. It is not uncommon for a state titleholder to go through a large can of hairspray each month. Girly-girl or not not wearing make-up is not an option when you are competing for and holding rodeo queen titles. If you are not accustomed to wearing make-up it is best to begin learning to apply it several weeks, or months, before the pageant. Seek out a professional to help you with colors and styles of make-up. 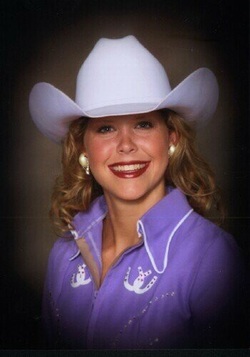 A natural look is the preferred look for rodeo queens. Avoid heavily lined eyes, heavy blush and garish lipstick. However, different settings require different styles of make-up. The make-up you wear for horsemanship and fashion shows will be different than the make-up you wear for personal interviews. Junior and teen queens should opt for a much more natural look with a touch of mascara, little to no eyeliner, and softer lipsticks. Always apply your make-up in private and if at all possible refresh it in private as well.